​Data analytic tools help financial institutions understand how sustainability drives firms’ market value. In the late 1990s, as soaring Internet stocks pulled Nasdaq to new heights, people asked if the economy had fundamentally changed. Maybe old principles of stock valuation no longer applied. A 1999 Wall Street Journal article even suggested that investors should rethink the “quaint idea” of profits when valuing a company. If financial markets value different things at different times, is sustainability valued appropriately today? Some believe that sustainable companies are undervalued. In this article, we look at data analytic solutions that seek to correct such market inefficiencies and direct capital to sustainable companies. How financial markets assess sustainability has shifted quite a bit over time. Ioannis Ioannou (London Business School) and George Serafeim (Harvard Business School) studied how financial analysts’ views of CSR initiatives evolved between 1993 and 2007. In the early 1990s, analysts viewed CSR initiatives by companies as a distraction from the focus on profit and therefore lowered the companies’ valuations. Analysts’ interpretation of CSR reflected the dominant view of the firm as a set of contracts between different parties: shareholders, employees, suppliers and customers. Managers’ role, from this perspective, was to maximize monetary return on investment for shareholders. In only 15 years, analysts began to see firms as interdependent with a broad range of stakeholders. Such stakeholders are those with whom firms have contracts, but also local communities, government and the environment. In this view, the quality of stakeholder relationships creates financial risks and opportunities, as well as social and environmental value. Ioannou and Serafeim found that, over time, analysts came to interpret CSR efforts as a way of managing stakeholder relationships, and increased their valuation to reflect this new perspective. If market valuation of sustainability has come this far, it can change even more. This is, at least, the assumption behind some innovative data analytic solutions that seek to identify sustainable companies that are still undervalued today. Commonly, institutional investors integrate Environmental, Social and Governance (ESG) considerations into their strategies by eliminating from portfolios companies involved in questionable ESG practices. Investors see this as a way to reduce financial risk. However, as asset managers increasingly recognize ESG‘s role in financial success, they seek ways to automate the integration of ESG data into their decision-making processes and make it more sophisticated. As we discussed in a previous article, making sense of ESG information is challenging. Such information is abundant, it comes in many formats, and it presents metrics that are produced following different conventions. Three case studies show innovative approaches to analyzing ESG data and informing financial decisions. Such new solutions go beyond negative screening of risky firms, and direct investment to companies that stand out as sustainability leaders. Sustainalytics has been rating ESG corporate performance for over 25 years. In 2016, the company launched ESG Signals, a tool that derives investment advice by linking ESG ratings and firm financial information. To build its ESG ratings, Sustainalytics takes an “old school” approach, using extensive research by a team of analysts and engagement with the rated companies. But to translate these ratings into predictions of financial performance, Sustainalytics turned to machine learning and teamed up with Advestis, a company that specializes in this field. Machine learning is an approach that lets computers improve the way they perform tasks based on experience. This approach excels in many data analytic tasks that are too big for human analysts, or too complex for computer programs that use fixed rules. ESG Signals employs machine learning to identify which ESG variables are correlated with positive or negative returns, and uses these correlations to direct investment decisions. ESG Signals complements Sustainalytics’ ESG indicators with financial data on 1,600 companies, totalling over 500 variables for each company. ESG indicators can relate, for example, to animal testing policy, environmental supply chain incidents and the independence of the board of directors. The system identifies the most important indicators, monitors them, and produces risk and opportunity signals for investors. Like Sustainalytics, TruValue Labs develops corporate ESG ratings and links them with financial performance. But where Sustainalytics uses human analysts to develop ratings, TruValue draws on big data analytics. The company’s Insight360 platform rates companies’ ESG performance by analyzing text about the company from multiple Internet sources, such as news and social media. This automated approach allows ratings to be updated daily instead of annually. Insight360’s automated approach uses sentiment analysis, a technology that identifies an author’s attitude to the topic he or she is writing about. When the system flags a reference to an ESG issue in relation to a company, it also assesses how positive or negative the discussion is. Ratings reflect the overall attitude toward the company across a wide range of analyzed sources. The resulting score can be called “an objective sentiment,” suggests Jim Hawley, TruValue’s Head of Applied Research and professor emeritus at Saint Mary's College of California. TruValue Labs claims that the ESG intelligence uncovered by its platform can yield substantial financial gains. In a backtest on historical data from 2013-2017, TruValue found that a portfolio guided by Insight360 beat a benchmark of S&P 500 stocks by 5% per year. A measure of how much ESG performance trended up or down over the last 12 months was especially predictive of future financial performance. Company culture has traditionally has been hard for investors to systematically assess. Culture Capital takes a data-driven approach to identifying companies with strong culture and investing in them. The company uses ESG data to assess culture. 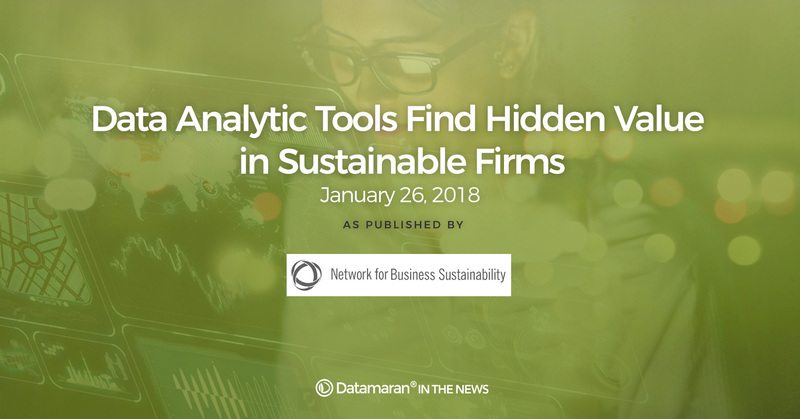 It relies on Datamaran, a platform that analyzes ESG sources such as corporate reports and online news. Datamaran screens these sources for references to relevant cultural elements such as transparency, employee retention, and community engagement. Burger believes that Culture Capital’s investment approach takes advantage of Wall Street’s blind spot, “with investors that focus so much on the short term, and all these quarterly statements, that they lose track of the long term.” Instead, Culture Capital tries to capture companies’ investment in a culture that can help them thrive over the long term. Does Improved Valuation Advance Sustainability? ESG Signals, Insight360, and Culture Capital are designed to help investors profit from untapped insights from ESG data. But do they also support sustainability? Sustainability benefits may develop if such solutions channel capital to sustainable companies and increase their access to financial resources. By establishing sustainability as a source of competitive advantage, these solutions create market incentives for it, and further integrate ESG into investment strategies. On the other hand, these solutions do not value sustainability for its own sake, but for the financial gains it produces. Therefore, the incentives these solutions create would hold only as long as sustainability and profit are aligned. The evolution in financial markets’ assessment of sustainability, it seems, is far from over.